Time of Day Routing is a feature that allows you to automatically change the forwarding destination for a specific inbound number based on the time of day and day of the week. This feature is part of the Enhanced Inbound add-on and Hosted Voice upgrade in turboDial. 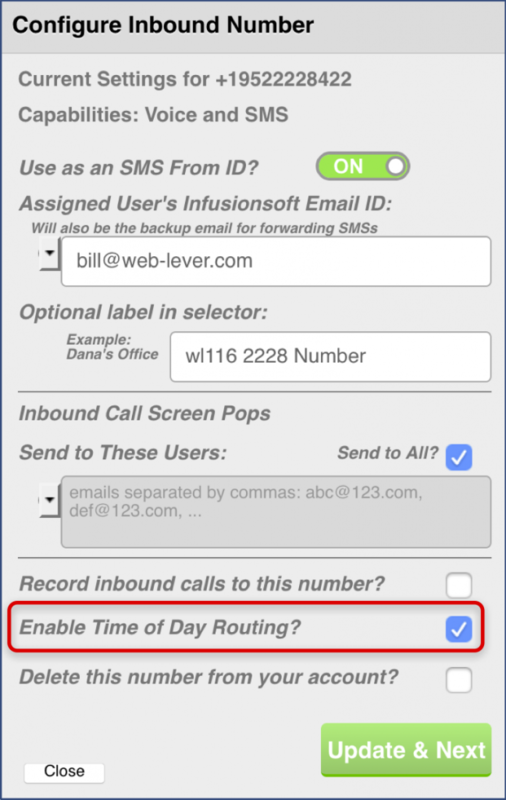 The Time of Day Routing feature cannot be used with other Enhanced Inbound/Hosted Voice features on the same Inbound Number. 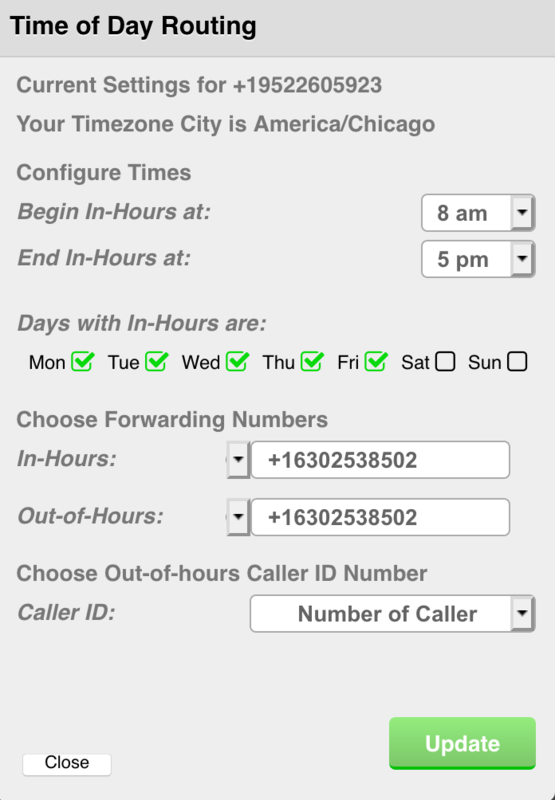 If you need to use both Time of Day Routing and other Enhanced Inbound features with your inbound calls then you must setup a Cascade of numbers: Your primary published number will have the Time of Day Routing feature configured, and your secondary unpublished number(s) will have the desired Enhanced Inbound features configured. So a call inbound to your primary published Inbound Number will undergo Time of Day Routing to your secondary Inbound Numbers. And on those secondary Inbound Numbers you can configure your forwarding destinations and advanced features such as Voice Mail or Auto Attendant. On that screen you will find the “Enable Time of Day Routing?” option. When that option is selected the configuration for Time of Day Routing will appear in the next screen when you click the “Update & Next” button. In-Hours: The single contiguous interval of time during a day when your calls will be forwarded to the In-Hours number. You will often set this interval to the same as your company’s business hours. Out-of-Hours: The times during a day when your calls will be forwarded to the Out-of-Hours number. The Out-of-Hours interval for a day will include two segments of time: 1) the hours before the In-Hours interval begins, and 2) the hours after the In-Hours interval ends. Some days of the week may have no In-Hours intervals, and all hours on those days will be Out-of-Hours. Note that the timezone for the times you choose here will be the one specified in your timezone city even if the number being configured is actually associated with a country in a different timezone. Take note of your Timezone City. All time selections will be relative to that timezone. Choose the hour of the day when when your In-Hours interval begins. You are not able to choose minutes before or after an hour. The In-Hours interval will begin exactly at the top of the hour. Choose the hour of the day when your In-Hours interval ends. The In-Hours interval will end exactly at the top of the hour. The In-Hours interval must end at a time later than it begins. Choose the days of the week when you have In-Hours time. For example, if your company is open Monday through Friday then check the boxes next to those five days and leave Saturday and Sunday unchecked. Enter a Number* as the Forwarding destination for inbound calls during the In-Hours interval of a day. Enter a Number* as the Forwarding destination for inbound calls during the Out-of-Hours intervals of a day and also for days with no In-Hours intervals. You may optionally choose a specific Caller ID number to be used when Forwarding calls out-of-hours. If you set it to “Number of Caller” then the phone number of the inbound caller will be used as the out-of-hours outbound Caller ID. But if you are forwarding an out-of-hours call to an answering service you may need to identify your company’s account by using your company phone number as your Caller ID. If you choose a Caller ID in this step it must be one of the numbers already validated as a Caller ID in your turboDial account. Once you have your Time of Day Routing setup as desired, click the “Update” Button to save the settings. When the update succeeds you can click the “close” button. *Note, the Inbound Numbers referenced in steps 5 and 6 do not need to be numbers acquired within turboDial unless you want to use other Enhanced Inbound or Hosted Voice features on those numbers such as forwarding destinations, Voice Mail or Auto Attendant.